Back at the end of both March and April I posted about two contests going on. What were they for you ask? 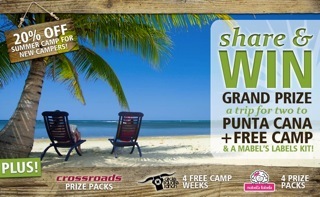 Two chances at winning free camp for your kids, plus a chance at winning a getaway for you and your hubby or a friend. 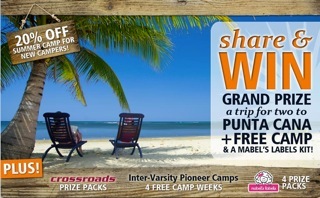 Well that contest is still going on with both Pioneer Camp and Circle Square Camp so if you haven't entered, you still have a chance to before it's too late. It takes less than five minutes and think of what would happen if you won, your kid would be gone enjoying themselves at camp having an experience of a lifetime while you were relaxing on the beach in Punta Cana! I don't know about you, but that sounds amazing. I can't wait until my kids are old enough to enjoy camp. Both the hubby and I both went with our church group when we were younger and we both had great experiences that kept us bonded with the same friends for over twenty years. CLICK ON THE IMAGES BELOW TO ENTER!